Broken dreams in La La Lands! Amazing story of a genius songwriter who was, one day a king, and the next day a beggar. 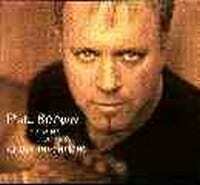 Known as one of the best musician guitarists/ singer/ songwriter-based in the city of angels, Phil Brown wrote for Pat Benatar, Cher, Tower of Power, BonnieTyler, Kim Carnes, Kix, Lou Graham (Foreigner) and Steve Perry (Journey). His songs went gold and platinum many times with his magic songwriting. L A who made him famous for a while took all the glory back with no pity. After twenty years of making songs for other artists and bands Phil releases with "Cruel inventions" his first shot, under his own name, in a lifetime of musician. He gives a new and very special taste to Mingus or Hendrix songs and the way he makes love to his guitar reminds us the late Jimi. Awesome, so full of emotions, playing like he's gonna die in the next two minutes! A heavy Fender guitar lick cries out on Melrose Avenue, late, very late at night!